Today’s topic is about networking “in the real world”, bringing those online relationships to another level. I admit, this is something I’ve been working on, but I’m no expert. Still, I will share an examples of how books and book reviewing are a part of my “real” life. Living in Savannah, we are lucky enough to have a fantastic library system. 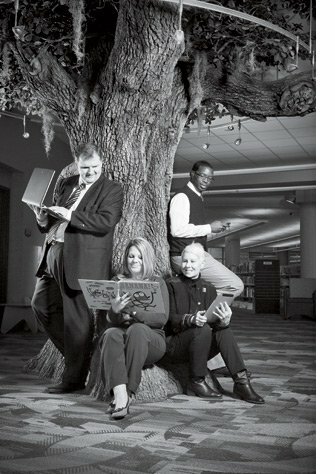 Live Oak Public Libraries does wonderful things for the area and I support them as much as I can. When I got married, I asked guests to bring gently used books that I later donated to the library. I don’t have lots of money to donate but I help in other ways. Every couple of months I donate books that I have read for review to them. They often add them to their catalog; and the ones that don’t make it into their Book Sale, which supports their costs as well. I also wrote an article for Connect Savannah about their annual gala. I donated the article to the paper and asked the paper to in turn donate my writer’s fee to the library. The story was picked up by Geek the Library campaign! That was one of my favorite “networking”moments! Yes! My donations to the library have increased so much since I started book blogging. I give them all of the books that I don’t want anymore. The library system was one of my favorite things about living in Atlanta when I did – so many opportunities! That is a great networking story! My involvement with the library has been as a volunteer, both for shelving and for friends of the library – and both have been a lot of fun. My post is about my travels to the Tucson Festival of Books. Sometimes the personal help is the best kind, don’t you think?